T. GRAHAM BROWN HITS TELEVISIONS NATIONWIDE TO PROMOTE ALBUM, ‘FOREVER CHANGED’ | 2911 Enterprises, Inc.
NASHVILLE, Tenn. – Just one year after making his return to music, country chart-topper T. Graham Brown continues to capitalize on his current momentum with multiple upcoming television appearances on “Ray Stevens’ Nashville” January 30 and “The Joey Canyon Show” February 5. The soulful singer/songwriter has continued to turn heads with his latest Grammy-nominated project Forever Changed, which features collaborations with Vince Gill, The Oak Ridge Boys, Jimmy Fortune, Leon Russell, Steve Cropper, Jason Crabb, Sonya Isaacs and others. Brown will appear on a brand new episode of “Ray Stevens’ Nashville.” Fans will get a special treat as Brown steps on-stage for a performance of the riveting “Wine Into Water,” a song that helped him, and ultimately others, fight the battle against substance abuse. The episode is set to air Jan. 30 on RFD-TV (check local listings here). 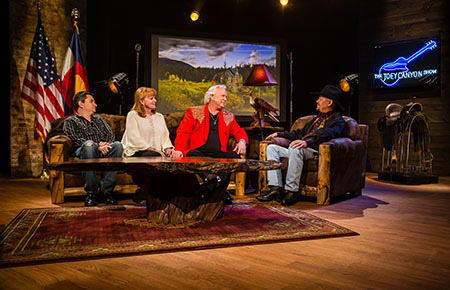 “The Joey Canyon Show” is the latest breakout show to hit RFD-TV. The 30-minute series was shot on-location in scenic Denver, Colo. and will feature Brown performing two of his biggest hits. The episode is set to air Feb. 5 at 10/9c (check local listings here). Don’t miss another must-see episode of “Country’s Family Reunion” on Feb. 20, as other artists collaborate with Brown on a very special tribute episode. The renowned television series was developed in 1996 by long-time radio personality, actor, and founder of Gabriel Communications, Larry Black. Its purpose is to bring America’s favorite country, bluegrass and gospel artists together in one room to reunite and share their favorite memories about their music careers. The program will also feature a tribute to country singer BJ Thomas. T. Graham Brown has recorded over 15 studio albums and charted more than 28 singles on the Billboard and Gospel charts. Six of these singles reached Number One and eight more reached the Top Ten. Brown’s voice is also recognized from his singing in advertising campaigns for McDonald’s, Disneyland, Almond Joy, Coca Cola, Dodge Truck, Ford, Hardee’s and many others including the Taco Bell “Run For The Border” television spots. This past year, his appearance in the concept video for “Working on A Building” with Marty Raybon, Jimmy Fortune and Trace Adkins aired across multiple national television networks. Brown still actively tours throughout the year including multiple appearances on the legendary Grand Ole Opry and television appearances such as Larry’s Country Diner and Country’s Family Reunion. His uniqueness has made him one of the most beloved performers of the day. The latest album, Forever Changed,garnered T. Graham his very first Grammy nomination in 2015. Brown has recently been featured on CMT.com, Country Weekly, Billboard and more.